Sports Costs > Gym > How Much Does a Gold’s Gym Personal Trainer Cost? How Much Does a Gold’s Gym Personal Trainer Cost? Since 1965, Gold’s Gym offers a diverse set of amenities that range from fitness classes to certified personal fitness trainers. If you want to join your local Gold’s Gym or maybe you’re already a member, a personal trainer can help you succeed with your fitness goals. 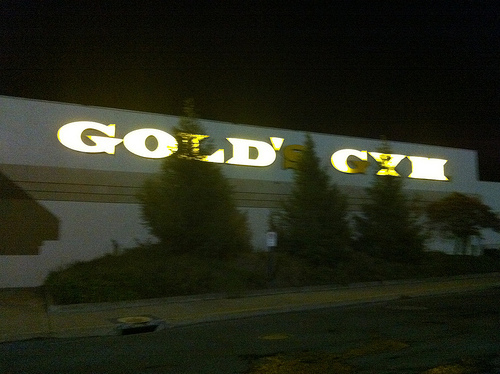 How much does a personal trainer cost at Gold’s Gym? The cost of a one-on-one Gold’s Gym personal trainer is going to depend on the number of sessions you want and the time of year as deals greatly vary. Since Gold’s Gym charges by the half hour, plan on spending around $35 to $55 per session with a personal trainer; however, the more sessions you purchase in advance, the more you will be able to save per session. Since these gyms are franchised owned, you will find that it will vary from gym to gym. The average session will last 30 minutes. According to someone on Yahoo! Answers, they claimed that you should budget at least $60 per half-hour session. A forum member on this FreeAdvice.com forum thread claimed that they spent around $320 for 8 sessions. On this SparkPeople.com thread, someone asked what the average personal trainer charges at a Gold’s Gym. According to the responses, one member said he was able to pay $25 per session, but the average rate was $40. The only reason he was able to get a deal was due to paying in cash. The personal trainers at Gold’s Gym are available for all fitness levels, include beginners, weightlifters or those who are simply looking to lose weight. Weight loss trainers can help with nutrition, providing support and guidance as to how your diet should look to reach your goals. Strength trainers, on the other hand, can instruct you as to which strength workouts will work best for your situation while motivating you at the same time. All personal trainers available at the gym are certified and highly trained, as according to the Gold’s Gym standard, and no matter which trainer you choose, these trainers will help motivate and transform your health into real goals. Group personal training sessions are often available for a lower cost. Talk with your local club to see if these options are available. Buying sessions in bulk can often bring the costs down by more than 30 percent. Talk with your club when you first join as many locations, according to our research, offer a free session for first-time members. Check out daily deal websites such as Groupon. For example, at the time of this writing, a Gold’s Gym was offering two one-hour personal training sessions for up to 94 percent off.